Economy: Corn and other foods are no longer imported since a national self-sufficiency program was launched in the early 1990s; however, most durable and electronic goods must still be imported. Coregos is best known to most Americans as being the country that, according to a high-profile 1994 study by the National Geographic Society, less than five percent of high school students were able to locate on a world map. This notoriety is a strange fate for a country that, less than a century before, President William McKinley described as “absolutely fundamental, absolutely crucial, to the future of the United States in this hemisphere” (Brotherton: McKinley and American Foreign Policy). McKinley spoke with an eye toward the Torreños Depression, a wide valley amid Coregos’ mostly mountainous terrain, as a likely route across the Central American isthmus. When a populist government headed by León Garcia, a former peasant, offered a German engineering firm the contract to build an ocean-to-ocean canal, the U.S. responded by sending two divisions of Marines to occupy San Esteban. 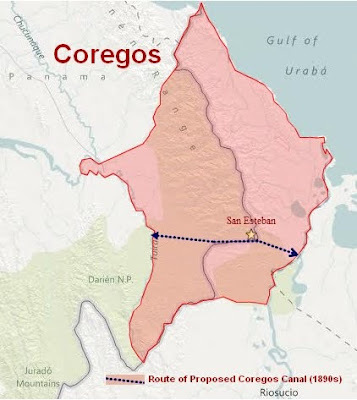 This military presence continued until well after the construction of the Panama Canal, which follows a route most modern observers feel is much inferior to that of the Coregos route. Today, the United States has surprisingly little involvement in Coregos. American-owned agricultural corporations own relatively little land in Coregos compared to many of its Central American neighbors, and have exerted little influence over its national politics. This does not mean that foreign ownership is not a concern, however. As of 2005, a startling 47% of Corego’s banana-producing farmland was held by the Brazilian conglomerate Tropoa. Flag: A golden chevron interrupts horizontal fields of red and blue. The symbolism of this design, if any, is unclear. An unofficial flag of Coregos, featuring a stylized coral snake on a field of deep blue, is seen at least as often as the official flag once outside of San Esteban’s government district. Coregaños often refer to themselves as serpientes – “snakes” – for reasons that remain unclear. I did a search for a map of Coregos, and your blog came up as the first two results. This leads me to believe that you made this place up. Do they have unicorns there? This from a man who runs a blog called "Liars Club". Shame on you for casting aspersions on M5K's geographical veracity. I'm calling BS on this one. I wonder if any of the previous Forgotten Lands are made up, I didn't check. Okay, so today I learned that the forgotten lands are not real. This kinda shatters my entire perception of reality, thanks. It really is amazing how difficult it is to find information on the Forgotten Lands. Wait... the forgotten lands are not real??? What? Find a better picture of the government district flag while you're at it. That one looks like a cut and paste of a blurry, badly clipped coral snake onto a blue field. It's like there wasn't a real flag around so someone tried to make one digitally. P.S. The forgotten lands remind me of the fictional countries in The West Wing. They had one on almost every continent to stereotype without offending an actual nation. There as Qumar in the Middle East but I've forgotten the European one (in the Balkans) and the African one. Funny...when I saw the coral snake, I smelt a RAT instead. BTW, were there some fake countries on that quiz??? Oh, and one reason you couldn't sell this one was: M5000 never goes anywhere or does anything without a map! And that includes blog-posting. I clicked on the comments in order to ask you why I could find no reference to this country on Google--except for your own blog postings, but I see I'm way behind your other readers in that regard. Michael5000- The world's foremost expert on Coregos, Beny-sur-Thames and the history and politics of the micronations of the world. Coming soon to a lecture theatre near you. Words cannot express how dramatically my eyes are rolling at some of these comments. If only I could leave an animated gif to express my amused condescension. I don't remember a European one, Aviatrix, but the African one was called "Equitorial Koondu" or something like that. I was rewatching that episode recently. OMG LOL WTF Chance Lives!!! Only Qumar, Equitorial Kundu and the Sahelise Republic make this list. Threither Wikipedia missed one, I just wished they had a fake European country to match, or the former Yugoslavia has split into so many pieces that I thought reality was parody. Threither is a word I just made up for when you have structured a sentence with 'either' and then realize that you must allow for a third possibility. I'm UnwiseOwl, and you'd better believe I endorse this word. It's my understanding that the Coregos coral snake (which gets waved around a lot whenever its citizens start talking foreign policy) is actually meant to be airborne, as conveyed by the blue background and a common expression translatable as "mad as a flung snake." Hence the unconvincing cut-and-paste image, as attempts to record that event have thus far always ended somewhat disastrously for the artist. I'd just like to point out that the snake looks slightly less cut-and-pasted than it did the first time around. Furthermore, you have pretty high expectations of the Coregian peasantry. They can't afford expensive flags! Give 'em a break already! Ah... so the flag of Coregos isn't a flag so much as an actual snake. That's such a cool idea that I am now desperately hoping Coregos wins an olympic medal, that's a flag-raising ceremony that I want to see. You guys. Coregos is an island near Oz ruled by the wicked Queen Cor until her defeat by brave little Prince Inga of Pingaree. You can get there, but normally only by accident. True, that, I didn't pick that up the first time. Was that a deliberate allusion, M5000?